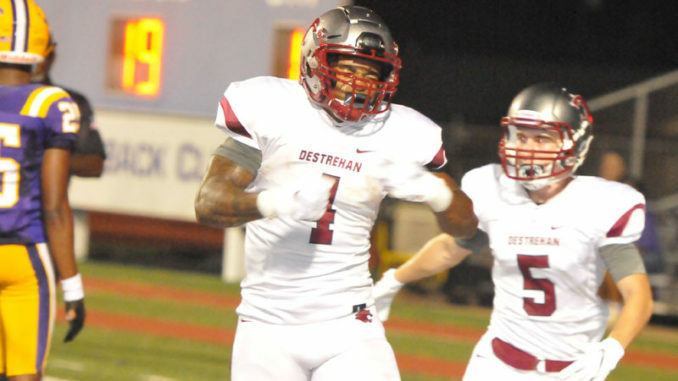 Destrehan's John Emery gets fired up after scoring a touchdown. Destrehan is quite familiar with Slidell, and vice versa. The two teams will be squaring off for the fourth consecutive season this Friday night, when the Tigers play host on the Northshore to the visiting Wildcats. Slidell has been an ascending team under head coach Larry Favre’s watch, and Destrehan head coach Stephen Robicheaux said 2018 has been a year the school has been building toward with high expectations and lofty goals. Adding to the excitement for Slidell’s fans is that the school will be retiring the jersey number of SHS great and former New Orleans Saints wide receiver Brett Bech. Senior Jacob Guidry is an experienced quarterback who leads the way for Slidell. He puts pressure on defenses with his ability to both pass and run, and he’s not one to shy away in the clutch. Last week, he led a 76-yard touchdown drive to seal a comeback win over Lakeshore, with running back Harlan Dixon scoring from 6 yards out with less than a minute remaining to push his team ahead for an eventual 22-15 win. Both are players who impress Robicheaux, with hybrid playmaker Tito Simmons cited as another major threat. “It starts with Guidry,” Robicheaux said. “He’s a kid that makes good things happen in bad situations. He can escape trouble and run the ball real well. We’ll have to try to put a little pressure on him, but when you do that, he can pull it down and run with it. So you have to contain him. Defensively, Ishmael Burdine has caught the attention of several Division I schools, a 6’1 safety who the Wildcats must account for, particularly downfield in coverage. “He’s extremely fast and a big kid as well. That’s definitely someone who can make things difficult for you in their secondary,” Robicheaux said. Kobie Pettis and Donte Daniels are also playmakers at linebacker and cornerback, respectively, who Robicheaux said he and his team will be mindful of. Up front, the Tigers don’t bring a lot of size beyond 6-foot-5, nearly 300 pound nose guard Marcus Candiff, but Slidell creates problems with an active, aggressive front that Robicheaux likened to his own team’s defensive build. That may not be all that surprising: Destrehan defensive coordinator Malter Scobel held the same position with Slidell under Favre for the past three years. WILDCATS STOP LUTCHER STREAK AT JAMBOREE: Robicheaux saw his team facing a fourth and seven just before halftime from Lutcher’s 22-yard line in Friday night’s jamboree, and he didn’t hesitate in making the call to go for the first down — and to do it by handing the ball off, at that. When John Emery is your running back, it’s easy to see why. Emery made a powerful run for the first and then some, dragging several Bulldogs defenders with him and setting up an eventual Destrehan touchdown to take a 13-7 halftime lead. It went down as the signature play of the Wildcats’ eventual 24-14 victory, snapping Lutcher’s three-game win streak over the Wildcats in the annual preseason jamboree scrimmage. Kyle Edwards took the ball off tackle left for the go-ahead score at half, the two rushers combining with Ed’Juan Green for a big rushing night overall. Destrehan took a two touchdown advantage on J.R. Blood’s 19-yard quarterback keeper run with 7:46 to go in the second half. Then Destrehan found its chance to put the game away when Albert Owusu’s big hit on a Lutcher receiver popped the ball in the air and safety Champ Craven caught it for an interception, setting up a Mike Ehrmann field goal to make it 24-7. Emery took the ball in for Destrehan’s first score on a 20-yard run.